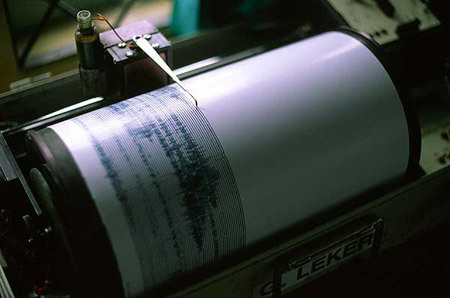 A seismograph is an instrument used to record seismic waves caused by earthquakes, nuclear explosions, etc., and in prospecting. The record it produces is called a seismogram. In its simplest form, it contains a horizontal bar, pivoted at one end and with a recording pen at the other. The bar, supported by a spring, bears a heavy weight. As the ground moves, the bar remains roughly stationary owing to the inertia of the weight, while the rest of the equipment moves. The pen traces the vibrations on a moving belt of paper. Most modern seismographs are based on the type developed by John Milne and his colleagues in the 1880s.